"Tibb truly looks at the whole person"
"Finally, a framework in which to understand information on health and a philosophy to give it context, thank you." "Hakim M Salim Khan is an inspirational teacher"
"An excellent course, challenging & thought provoking"
"This traditional approach truly looks at the whole person"
We welcome feedback from our students with a view to improving what we offer and sharing what you have found beneficial with prospective students. Thank you kindly for the wonderful course in Tibb medicine. To study for the Diploma with you has been a pleasure. I'm tremendously grateful for your guidance and wisdom in teaching, directing and inspiring me in this journey I've embarked upon, the noble path of natural medicine, care and healing. The course offered the insights and practices of Tibb Medicine. I've learned that Tibb is not only an ancient time-tested tradition of healing, but a way of life. Our modern era, full of chronic, non-communicable diseases is surely crying out for Tibb and inshaAllah the only way for it is forward. May Allah (swt) bless you and reward you for being a gracious teacher, where so many benefit from your knowledge. My name is Fatima and I have just completed the Diploma in Herbal and Naturopathic Medicine from the College of Medicine and Healing Arts. Although the journey seemed long, I have thoroughly enjoyed studying this beautiful tradition of Tibb and I am sad to see my time studying with COMHA draw to a close. I am first and foremost, highly grateful to the Hakim for allowing me to embark on my Tibb journey and giving me the confidence to pursue this journey further. His wisdom and guidance has been invaluable and his attentiveness to our own healing has been profound. The course has not only been extremely informative but life changing to say the least. It has allowed me to truly understand how the body works in its entirety, and that its harmonious balance in all aspects is the key to health. I hope that this key will help me to help others in a world where the presence of this rich tradition is much needed. Although there is still so much to learn and experience, I thank the Hakim for opening the door and providing me with the necessary guidance to continue further. I wish the Hakim, the students and future students tawfiq in this endeavour. I would also like to thank the staff at COMHA for making our stay and studies always that much easier. May we uphold this tradition with the dignity and respect it deserves and allow it to bring harmony and balance in a world where disharmony and unrest is becoming that much more apparent. Alhamdulilah, it’s been really hard work, but after 3 years I am very happy to be a graduate of the College of Medicine and Healing Arts in Herbal and Naturopathic Medicine (TIBB). This course has allowed me to transform my life in many ways, so much so, that my family and friends have also found great benefit in my learning. For those serious about a career in traditional medicine, then this course provides the learner with the fundamentals, to not only heal oneself, but also to begin a journey of healing for others. Our teacher, Hakim Salim has the ability to inspire and instil knowledge in a way which is traditional, yet powerful. The course content allows both practical and theoretical learning, and insists upon visible self-development and personal journaling along the way. I pray that with the continued nurturing of Hakim Salim, that I become an asset to his teachings and that my growth continues each day, as a means of benefit to our communities and the longevity of Tibb itself. Alhamdulillah, by the grace and blessings bestowed upon me by God, I can say, I passed and am now a graduate of Unani Herbal Medicine. What a wonderful feeling of accomplishment we all feel. The theoretical framework of this course provided us with the knowledge’s of the different constitutional types, the 4 elements, the spirits, the functions and the 6 lifestyle factors, this, along with the module Physician Heal Thy Self, assisted us to re-balance and acquaint us with ourselves in a whole and fulfilling manner. The practical components of the course, gave us hands on experience with traditional methods of grinding and preparing culinary herbs and spices. Mock up consultations under the guiding watch of the Hakim enabled us to see how clinical skills such as, pulse; tongue and face analysis, along with iridology and other observations could be used to help us reach a conclusive diagnosis of the whole person. We are indebted to the whole team at the College of Medicine and Healing Arts, in particular, the Hakim, for his continued investment in our teaching, nurturing and guidance, moulding us into the practitioners of the future. His wisdoms and foresight gave us knowledge’s we could never have acquired through books, but only through sitting at the feet of people like himself. His knowledge and experience as an established physician enabled us to become better aware of legislation in present times, the disposition of a person centred practitioner, maintaining authenticity as a practitioner of Tibb, whilst finding new and innovative ways to deliver this ancient tradition of medicine. We ask God for tawfeeq, May He make us practitioners who seek to serve people and become a means of immense healing to many. Please continue us in your prayers. Good news! 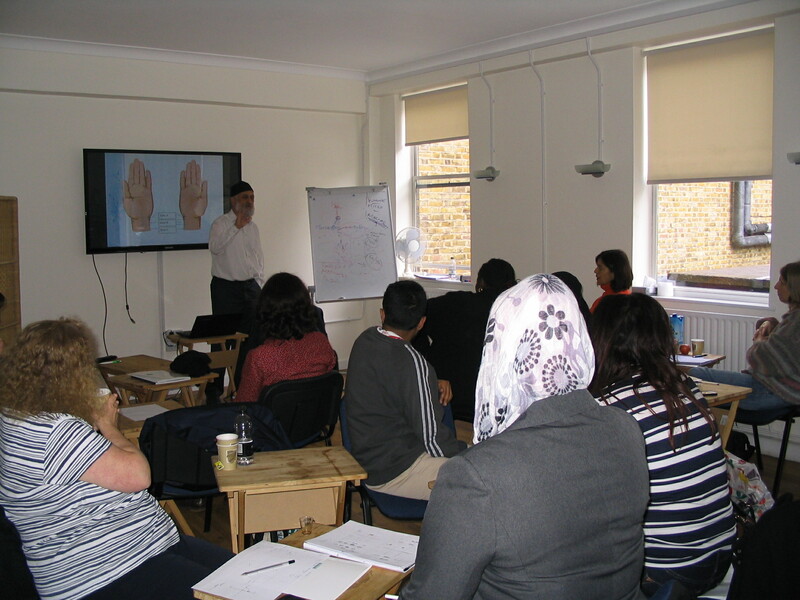 Our course 'Introduction to Health & Well-being' which took place on 16th and 17th May 2014 was a huge success. We received lots of positive feedback from the students, which not only helped them individually, but they also found the course notes easy, understanding, and thoroughly enjoyed the class activities. "I am so pleased with the course, it has exceeded my expectations"
"Brilliant tutor! I loved the calm nature which the Hakim had led in the course and the wisdom with which he imparted the knowledge, he was able to break down complex knowledge in an easy and understanding manner"
"I loved the course, and I feel I am more connected to myself, my needs and what my challenges are. I also feel connected to others by understanding them more. I want to continue with the course programme"
"The style of delivery was very palatable, and the examples used were suitably presented, such that everybody could take and benefit from"
"Breaking down and simplifying the humours, elements and food energies, it was so easy to understand...all in two days"
"Thank you so much for running this course and offering this out to others with a humble approach"
"The tasting test activity was helpful, because we always eat but we don't think about it, and this test made me aware of what I am eating, and what the nature of the food is. Also, the human demonstration of the mizaj helped to explain that two people from the same mizaj are not always same due to different degrees." "Class discussion was helpful in understanding unani tibb, and how we as human beings work as a whole. Lastly the books from reading list given beforehand helped me prepare for the course"
I’ve never been on a workshop with such a chilled teacher as Hakim M Salim Khan, but it totally suited the Sunday when this was taught. This was a hands on workshop enabling the delegate to get to grips with the basics around pulse taking, and we had plenty of chance to practise. Taking us through a brief history, setting the scene, he explained how some people say they can tell everything from the pulse, my first session was to practise finding it! I did, my partner had a pulse and fortunately a sense of humour, always a good thing during practise sessions. Practise makes perfect and I am someone who does far better with a practical hands on learning session than a purely theoretical one, and we spent the first session learning to find the pulse and placing the fingers in the right places on the arm. Once past this initiation session, we learn how to feel for the depth of the pulse, length, and width all which apparently give you different pieces of information. A fascinating way of understanding someones health in more detail, understanding heat, moisture, and vital force of the individual. Interestingly one of the delegates got to grips very quickly with understanding the pulse she was taking, applied what she had learnt with her own knowledge and found an issue with another delegate she was practising on which was incredibly accurate. She was highly impressive, and that was only after a few hours of learning how to read the pulse. It’s very quick to get an understanding of at it’s basic level, and application in practise happened on the first day for me, giving me a whole new tool to work with. What it did bring home to me was how little we stop and listen, and truly take time to experience in our lives balance. When I’m in practise there is always a timescale to work to, and this can prevent a true exploration of the individuals health in the depth I would like. Pulse taking, takes time, you have to be in the right place yourself to be able to take it competently, you have to be able to feel, to listen, and have the time, and this won’t be of use to practitioners who tend to work quickly and to short timescales. But then it made me consider how we should be giving people more time not just in practise but in general.